Here is your opportunity to enjoy country living in your very own farmhouse with over 3 acres for livestock. Built around 1941 this 3 BDR home offers approximately 1,700 sq ft of living area. Master bedroom, full bath, washer & dryer all on the main level. A new shingle roof installed approximately 3 years ago along with seamless guttering, on demand gas water heater and new pressure tank. No problem staying warm this winter as the home is equipped with heat pump, gas log fireplace and two LG split units. Newer stainless appliances with a gas range convey. A detached garage / workshop with 220 amp hookup and lean shed for a few horse stalls. Just over 3 acres of level pasture and cross fencing for you to enjoy livestock. 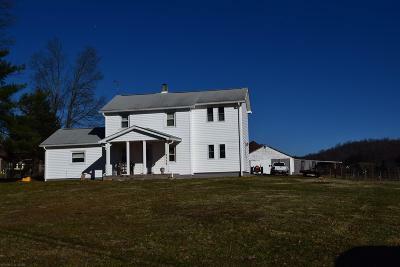 Located in the beautiful countryside of Bent Mountain VA just a few miles from Roanoke VA and a half hour from Floyd VA. Directions: From Town Of Floyd - Floyd Hwy N Towards Roanoke - After Crossing Into Roanoke County Continue On Floyd Hwy N - Property Will Be On Straight Stretch Of Bent Mtn On The Right Just Before Vdot Station. From Roanoke Travel Bent Mountain Road Towards Floyd County. After Reaching The Top Of The Mountain Property Will Be On Left Just Past He Vdot Station Marked By Sign.